The California dairy industry, the country’s largest, is in a tizzy about Coca Cola’s new ultra-processed milk product, known as Fairlife. It’s pitched as “better milk” that commands premium prices because it goes through special processing to reduce lactose and increase protein. While the stated objection to regulators by a California processed-milk group is that Fairlife isn’t necessarily processed properly, the real concern seems to be about the competitive threat posed by Fairlife. 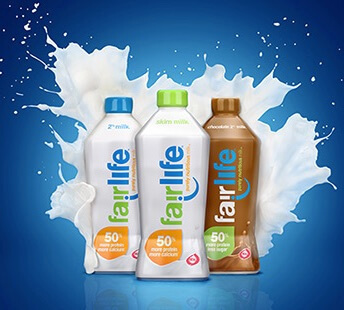 The California tussle began last April, when Fairlife filed a petition with the California Department of Food and Agriculture, seeking two “temporary standards” that would accommodate two varieties of its specially processed milk—a low-fat variety and a flavored low-fat variety. Milk must conform to certain standards covering the amount of fat, protein, and other nutrients contained in the milk. Just like nature intended, right? Last week, the California Dairy Campaign, an organization of dairy owners, asked the CDFA to refuse to grant Fairlife the “temporary standards.” In a letter, its executive director, Lynne McBride, stated: “We oppose the petition because the Fairlife reduced fat ultra-filtered milk products included in the petition do not meet the California fluid milk fortification standards.” Fortification standards have to do with powdered milk added back into processed milk to give it more nutrition. Another California dairy group, the Milk Producers Council, made up of processors, endorsed the Fairlife request, saying its members wanted to learn from Coke/Fairlife if it may have found a way to revived lagging pasteurized milk sales. With the temporary standards, “our industry will have an opportunity to see first- hand whether these high-protein, low-lactose fluid milk products attract new consumers to our market, and any impact that may or may not have on the sales of other fluid milk products,” its general manager, Robert Vandenheuvel stated. So which processed milk is the best processed milk? Or the worst? Tens of millions of dollars hang in the balance as the battle of the processors threatens to stub Coke’s toe. If nothing else, the battle of the processors will help consumers appreciate just how much processing goes on in nearly all milk. Sure makes me appreciate my real milk. I’d like to know why they are allowed to call it milk? What is a SOI request? My guess is that if it comes from a cow and it still looks like milk after the processing, and you have enough money to throw around to the lawyers, pols, and such, you can pretty much do as you please. I just can’t figure whose milk is more processed, that from Fairlife or the standard processed milk. David is right…SOI means standard of identity. No dairy product can be made or sold without strict compliance with a legal definition of an authorized SOI. This means: exact amounts of protein, solids, butter fat….etc. whether a dairy product can be made of raw milk. For instance, the federal SOI for ice cream says it must be pasteurized. No SOI for raw ice creams of any kind. Mark, how is “exact amounts of protein, solids, butter fat” measured, and by who? Is it a private or government process, who pays for it and how accurate is it? I always thought due to the variances in feed, geographical environment, water quality, along with day to day operation practices are too far ranging to be qualified into a cookie cutter regulatory scheme but try telling that to the power hungry regulators. And yes, this is my alter ego so I can post from work. Those words alone should raise red flags. @ Sylvia: My guess would be that about 90% of the people in the USA do not understand what the words “processed foods” even mean. Education in this area needs to start from the bottom and work up. And it won’t be taught in the school system as it stands now, I can tell you that. I’ve asked some of my clients questions from time to time and when I asked about processed foods, most of them thought it simply meant food that’s been prepared into a meal, even in home kitchens, not just junk phood joints. They really have no idea at all. It’s frightening. Is raw milk safe for someone with Crohns disease who is on immune suppressants? Or maybe give it to the Chinese to sell. Some gangs were just busted selling meat up to 40 years old, that had been frozen and re-frozen over the years, and had investigators holding their noses. Remember that most all dairies across the USA sell their raw milk to a coop creamery or national brand. They are paid for their ” milk components”. The first thing that the creamery does is to measure the butter fat, protein levels and solids. The farmer is paid by those measures of their raw milk. The the milk terrorism begins. It is fractionated into its parts. Fat is separated, proteins are separated, lactose is separated, solids are separated into different tanks….then each if the individual components are added back together according to standards and the SOI. The law specifies the levels of components required in each dairy product is not according to what comes out of a cow…it is according to what the SOI says. Creameries do all of this. Inspectors then verify using tests each month or even more often to confirm that SOI have been met. If a product misses an SOI, that product could be recalled or perhaps degraded. SOIs run the show. SOIs came into existence supposedly to protect the public from industry scams and to assure that dairy products contain the required levels of fat, proteins, solids etc. I hope that someday…there is an SOI for ” whole ness” if bacteria are missing or proteins are denatured then there is trouble. I can still dream!! More reason to know your local farmer, where you can SEE the product in its entirety. just to move things along here. All the world’s a stage” (Shakespeare). One thing conceived as representing another; a symbol: “Hollywood has always been an irresistible, prefabricated metaphor for the crass, the materialistic, the shallow, and the craven” (Neal Gabler). @ David: The fact that they were able to sell 40 year old stinky meat says something about the buyers, too. Interesting to note that recently, you just not hear much about raw milk illnesses or recalls in the news. I think that the message about safety has reached mass momentum. Now you hear much more about highly processed products and that is not newsworthy. So the news chases escaped prisoners and ISIS atrocities instead. Has raw milk reached a normalcy? Is it no longer news worthy because it is so common. If not there….we are getting close. The last stage of change is acceptance as “self evident and normal”. I did see this in the store. I picked up a bottle and looked it over. Loudly I stated it was nasty and put it back. A woman asked what was bad about it. I informed her that it was full of over processed synthetic chemicals and would probably affect the human body in an adverse way. I mentioned that I was concerned about what those chemicals would do to kidneys and the cardio/vascular systems, and not to forget the liver… I also said, who knows what the long term effects will be on the body. She thanked me and cast an unpleasant glance towards the display and a wide berth as she walked by.